Most of bollywood actresses have given up their careers after marriage to take care of their families. However the trend of giving up their full fledged careers has finally changed. Actresses are making a comeback post marriage in a big way and have been accepted by the audiences too. Madhuri Dixit : She bid adieu to her showbiz career after marrying US based surgeon Sriram Nene to settle down in Denver (USA) to start a family. 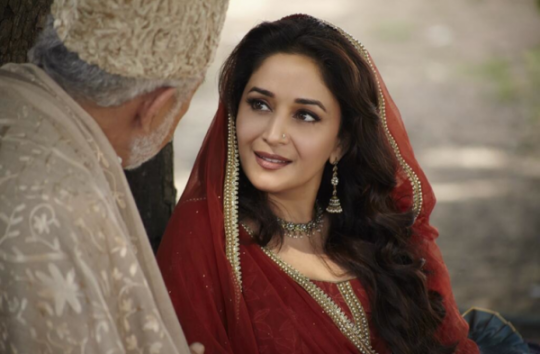 Now that she has had two children Madhuri decided to make a comeback in films. However her comeback film Aaja Nachle did not set the box office on fire as her earlier films.Critics wrote her off and said that it was not the right comeback for her. While some even commented that it was the end of her career. Determined she did not give up and she set about with new innings. She shifted bag and baggage to India with her family and did Dedh Ishkiya with Vishal Bhardwaj. The film did well at the box office and she had chosen an apt subject. Next she did Soumik Sen’s Gulab Gang. The film did not do well at the box office again. About her comeback the actress says “Many women decide to quit after marriage and it is their personal choice but there’s still a myth that women do not continue their profession after marriage. Actresses like Sharmila Tagore, Meena Kumar, Nutan, Tanuja, worked even after marriage. Age is just a number and talent can never die.” She kept herself busy as a judge with reality show Jhalak Dikhlaa Jaa for five seasons. The actress quit to start her own online dance academy. She has not signed any films as of now but is taking care with the projects she chooses. She also did a item song in Ayan Mukherjee’s Yeh Jawani Hai Deewani. Aishwarya Rai : Aishwarya Rai Bachchan made her comeback last year with director Sanjay Gupta’s Jazbaa after the birth of her daughter Aaradhya. This ex Miss Universe in fact had never bid adieu to her acting career. Soon after her marriage she appeared in Vipul Shah’s Action Replay opposite Akshay Kumar. She is now back and how. Aishwarya Rai says " When Sanjay narrated the subject to me it was easy to say yes as I get to play a character who is stuck in unique circumstances and it was a challenge and challenged personally and professionally it was a new kind of thriller. I hadn’t planned to make this my first film but this was what it was meant to be and I enjoyed it. You don’t realize that you are ready for a break or to make a comeback. The person that I am I commit myself completely to my circumstances. My middle name was multitasking whether as a student, or while working or before branding became so common and balancing that and I got married during the making of a historical film and yet never reduce my commitment. Yet I wanted to give everything as a wife, daughter in law and mother now. I have loved and continue to love every aspect of my life. I was doing brand endorsements so I never felt the gap.“ Aishwarya has two other projects in her kitty this year. A biopic on Sarabjeet Singh where she plays his sister and Karan Johar’s Ae Dil Hai Mushkil opposite Ranbir Kapoor. Kajol :Kajol quit films after her marriage to Ajay Devgn. She made her come back with Kunal Kohli’s Fanaa opposite Aamir Khan but the film was a box office dud. After the birth of her daughter she later made a comeback with Karan Johar’s My Name Is Khan opposite Shah Rukh Khan. The film was a hit. She later did Siddharth Anand’s We Are Family and Toonpur Ka Superhero produced by her home banner however the films did not do well at the box office. The actress took a break for the birth of her son Yug in 2010 and made her comeback with Rohit Shetty’s Dilwale opposite Shah Rukh Khan. Sridevi : She gave up her acting career after her marriage to director, producer Boney Kapoor to look after her family and two daughters. She made a comeback with Gauri Shinde’s English Vinglish and took Bollywood by storm. Critics as well as fans were awed by her presence. She has not taken a single film after that.” I don’t know why I didn’t come back to films. I wish Gauri had met me earlier. I would love to do this film at any given time. I wanted a chance to work in films and it just happened. I heard the script and immediately agreed to do it. I got a lot of offers but was busy taking care of my children who were too young and needed me at that time.I was lost in my own world" she stated then. She is now doing a south film Puli opposite Vijay being directed by Chimbu Deven. Apart from making appearances at the fashion shows the actress has not taken any interest in endorsements either. Her fans are waiting for the actress to make a big comeback. Juhi Chawla: She never bid goodbye to films but Juhi did not do too much work post her quiet wedding to Jai Mehta. After the birth of her kids Juhi decided to make a comeback with Ajay Devgn’s Son Of Sardar. The film was a hit and Juhi was appreciated. Her next big film was Soumik Sen’s Gulaab Gang where she played a character with grey shades but her audiences did not appreciate this image of hers. She was last seen in Jayant Gilatar’s Chalk & Duster.